Hirsutism is when females grow noticeable hair in places that are typical to men, such as on the face or on the chest. Hirsutism is not a disease, but it is a symptom of an underlying condition. Another category of causes of hirsutism is when the hair follicles are oversensitive to male hormones such as testosterone. Women who are obese tend to become resistant to insulin (Type II diabetes), and are at high risk of developing hirsutism. Hirsutism is a sign of hormone imbalance, possibly due to high circulating levels of insulin in their systems. The theory is that insulin, at sufficiently high levels of concentration, stimulates the ovarian theca cells to produce androgens.2 Larger quantities of male hormones are produced, resulting in masculine hair growth or hirsutism. Other conditions that may increase a woman’s male hormone levels and result in hirsutism include Cushing’s disease, certain medications, and Stromal Hyperthecosis (in postmenopausal women). Treatment could include addressing any serious underlying conditions, balancing the hormone levels, and/or offering cosmetic options. 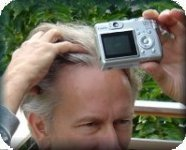 This entry was posted in Baldness, General, Hair Health, Hair Loss, Hair Loss in Women, Hair Problems on September 18, 2009 by Larry Shapiro.